The 8th matchday of the SG Table Football Premier League and Junior League took place yesterday (10/08/2014) at the Aranda Lounge, Orchid Country Club. With a good turnout of 16 players (10 Premier players and 6 Junior players), a total of 26 games were played i.e. 17 games in the Premier League and 9 games in the Junior League. There were many movements in the Premier League table as players catch-up on their unplayed games and, in part, due to the unfortunate withdrawal of Erfandy and Anis. 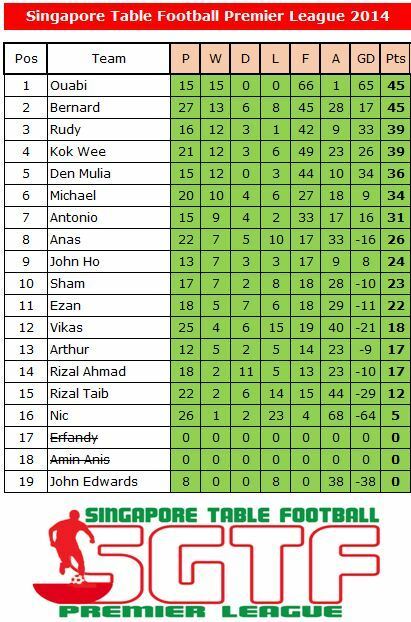 The Board of the SG Table Football Premier League has ruled that the results and scores of the games involving these 2 players shall be declared null and void. We hope that the 2 players can continue flicking and join us for TFAS tournaments and for friendly games whenever they are available on League days. Despite the movements, Ouabi remain top of the table even though he is still on holiday back in France. And thanks to the understanding of all League players, World Cup-bound Bernard and Rudy moved up to 2nd and 3rd respectively as they racked up the games for maximum practice and preparation ahead of the FISTF Subbuteo World Cup 2014 at Rochefort, Belgium. Over in the Junior League, Singapore’s No. 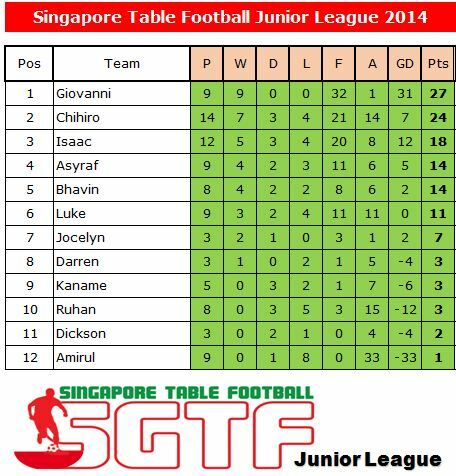 1 Junior player, Giovanni, stamped his authority on the League as he continued his 100% win record; and took over the leadership of the Junior League table. Chihiro moved down to 2nd while Isaac maintained his 3rd position. Both Asyraf and Luke moved up 1 position to 4th and 6th respectively.